A clinical study conducted at the School of Exercise Science at Australian Catholic University has shown that taking high quality calcium plus vitamin D significantly improved bone density, mass and strength in girls ages nine to 13- exactly what experts want to achieve in that time of life to prevent future skeletal issues. The National Osteoporosis Foundation tells us that we need more milk as a source of calcium to build strong bones, yet scientific evidence does not support this. Americans have the among the highest osteoporosis rates worldwide, while our dairy intake is also among the highest. A 1997 study indicated that of 78,000 nurses, those who drank more than one glass of milk per day had a 45% greater chance of hip fractures (American Journal of Public Health, 1997). Exercise and avoidance of alcohol, caffeine, salt and carbonated beverages can also help to prevent decreases in bone density. If you’re concerned that you may not be getting sufficient amounts of minerals such as calcium and Vitamin D from your diet and sun exposure, supplementation is the next best thing. BioVeda now offers the following high quality, dietary supplements that may help reduce your risk for developing osteoporosis and help you maintain optimal bone health. Vitamin D3 Natural: The Most Effective Vitamin D Spray Available Today! BioVeda’s Vitamin D3 (cholecalciferol) is a pre-hormone that has long been known for its important role in regulating body levels of calcium and phosphorus, and in mineralization of bone. Vitamin D3 can also help with heart health, cell formation and longevity, skin health, aging, hearing, reproductive health, eye health, respiratory health, immune support, weight management, muscle function, and strong, healthy bones because Vitamin D encourages calcium uptake. Researchers found that increasing levels of vitamin D3 could prevent diseases that take nearly 1 million lives throughout the world each year! And other studies showed that you can decrease your risk of cancer by MORE THAN HALF simply by optimizing your vitamin D levels. In addition, it is extremely rare for someone with optimized vitamin D levels to come down with the flu. The most important thing to keep in mind if you opt for oral supplementation is that you only want to supplement with natural vitamin D3 (cholecalciferol), which is human vitamin D. Do NOT use the synthetic and highly inferior vitamin D2. This is typically prescribed by many well intentioned doctors who seek to take advantage of a patient’s prescription coverage. Unfortunately this form is far more expensive than the real vitamin D3, which is one of the least expensive vitamins we have. But more importantly it does not work nearly as well as D3 and can actually block the real D3 from working properly. Bottom line: ONLY use vitamin D3 when supplementing. Calcium is often talked about as the solution for building strong bones, but although the majority of this mineral is found in your bones and teeth, it’s important for other bodily functions as well. For example, calcium has a large role in muscle contraction, blood clotting and cell membrane function. It also helps regulate the activity of enzymes, and if your body does not have enough available calcium, it can drastically effect your health — and even shorten your life. According to recent research, men who ate the most calcium-rich diets — taking in nearly 2,000 milligrams of calcium a day — had a 25 percent lower risk of dying from all causes, and a 23 percent lower risk of dying from heart disease, compared to men who ate about 1,000 milligrams a day. Calcium’s benefit come from several areas, including reducing blood pressure, cholesterol or blood sugar levels, according to researchers. Calcium is so important to your body’s ability to function that if you don’t have enough of it in your blood from dietary sources, your body will tap into its stored source, bones. 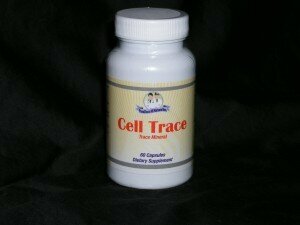 Cell Trace is a proprietary blend of 78 trace minerals. It is an ALL NATURAL product, free of binders and fillers. No chemicals have been added to this formula. Minerals are an essential part of life, and are just as important to a human as breathing. Minerals and trace minerals play a major role in our everyday lives and internal bodily functions. In the past, eating a healthy diet could provide the body with the minerals required for not only survival, but optimal health. Today however, naturally occurring, nutrient-rich soil is becoming scarcer with rapidly diminishing amounts of minerals available through even the best of diets. Eons of vegetation growth and aggres- sive modern farming techniques have brought many of the earth’s minerals to the surface where they have been washed away. Our bodies rely on trace minerals to conduct and generate billions of tiny electrical impulses every second of our existence. Trace minerals are the key for the health of every body system and function. Just as our bodies need vitamins, they need minerals as well. With Cell Trace by BioVeda, you never again have to wonder if the trace minerals your body needs are present in your food. You and your body can feel good about the all-natural ingredients in Cell Trace. Click here to order these high quality BioVeda products, today! Contact a BioVeda Health & Wellness Center to learn more about how you can optimize your health today!